There’s no fee to apply for ENERGY STAR certification, but applications do require review by a professional engineer or a registered architect who is able to verify that energy performance and indoor environmental conditions meet EPA’s standards. Even though the cost for verification is modest compared to other third-party certifications, many building owners, particularly school districts and religious and non-profit organizations, simply cannot afford this fee. EPA is helping these building owners find licensed professionals who are willing to provide verification services on a cost-free basis. By performing this valuable public service, licensed professionals will significantly increase the number of ENERGY STAR certified buildings, inspire others to raise the performance level of their facilities, and help an organization of their choice that otherwise would not be recognized for their outstanding achievement. Providing cost-free verification services benefits licensed professionals as well: it builds relationships and name recognition with nonprofit and public sector building owners and managers; develops the marketable skill of verifying ENERGY STAR certification applications; and enhances national visibility through special identification in the ENERGY STAR Licensed Professional Finder. 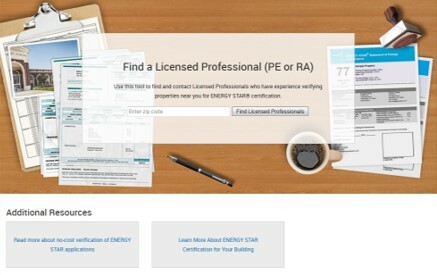 All licensed professionals who have verified at least one successful application for ENERGY STAR certification automatically appear in the LP Finder search tool. Licensed professionals interested in offering cost-free verifications can request this to be designated in the tool by simply sending an email to SPP@cadmusgroup.com indicating that they’d like to be listed as providing cost-free verifications. It’s then left to the LP and the building owner to discuss terms and conditions of any services provided. The American Institute of Architects (AIA) and EPA have partnered to help architects earn up to eight (8) annual Health, Safety, and Welfare (HSW) continuing education units (CEUs) for reducing carbon emissions in the built environment. Registered architects who attend a no-cost ENERGY STAR training webinar will earn one CEU. Those who perform a cost-free (pro bono) verification of one or more building applications will receive seven HSW CEUs, for a total of eight CEUs annually. The AlA will provide credit for verifying any eligible building, regardless of ownership status (e.g. non-profit, for-profit). After performing the verification, to earn CEUs from AIA registered architects must simply submit the signed verification letter to EPA. Once your client has submitted the completed ENERGY STAR application, you will receive continuing education credit(s) from AIA. Check out a new case study on how Hope Christian Reformed Church has improved its energy savings by using cost-free verification services provided by Goby LLC! The LP Finder helps building owners and operators seeking certification services to find LPs who have certified buildings located near them. 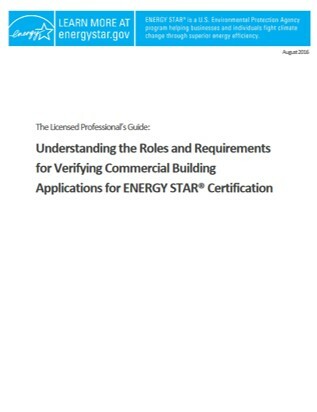 The LP guide provides everything you need to know about verifying applications for ENERGY STAR certification. It outlines the step-by-step process and is required reading if you’re verifying applications for ENERGY STAR certification.